The opener of the stage race ran from Koblenz to Bonn. After the start on the famous landmark Deutsches Eck, the riders crossed the Rhine south of Koblenz and went up the right side of the river through the foothills of the Westerwald towards Bonn. The peloton reached the city over the Kennedy Bridge, to end the stage with a circuit course. This first day covered more than 157 kilometers and provided no particular difficulties. That fact and the 2000 meters long run-in to the finish line in downtown Bonn were good news for the sprinters. The last time a rider raised his arm in the air on the finish line of the Deutschland Tour was ten years ago so who better then a young and promising sprinter to do so again on this brand new edition of the event. 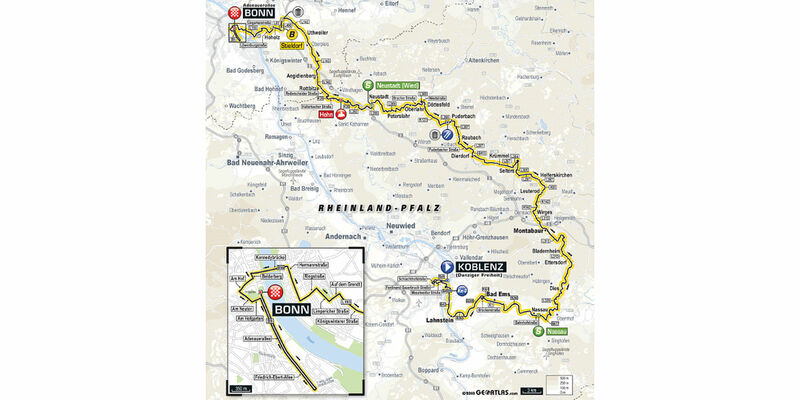 As expected stage 1 of the race was decided in a bunched sprint on the final long straight in Bonn but while many were expecting German specialists Kittel, Greipel or Ackerman, Alvaro Hodeg triumphantly powered to the line. The Colombian eventually captured the win ahead of Ackerman and Bonifazio and naturally conquers the overall leader’s red jersey. Ten years after it last took off, there was a clear feeling of pride and emotion in beautiful Koblenz when the pack of the “reborn” Deutschland Tour hit the road. Under a perfectly clear sky and in warm conditions the 131 riders including the likes of Tour de France winner Geraint Thomas but also Tom Dumoulin, Romain Bardet, Warren Barguil and local heroes Kittel and Greipel, took off just before noon for a 157-km ride heading to Ludwig Van Beethoven’s birth town, Bonn. After a fairly fast start and quite a few attemps, six men eventually managed to take off at km 18: Arcas (MOV), Van Melsen (WGG), Jarrier (FST), Reynders (LPC), Lubbers (LKH) and Reutter (HRN). They reached the first intermediate sprint in Nassau (km 25), won by Reutter, with a 2’30’’ lead over a pack led by teams Quick Step and Bora-Hansgrohe. That gap grew to over 3’ before dropping down again as the pack kept control over the escapees with the clear plan to let the top sprinters battle it out once in Bonn. With under 100kms to go, the gap stabilized around 2’30’’ as André Greipel’s Lotto-Soudal moved to the front of the peloton. At the second intermediate sprint (km 108), again won by Germany’s Reutter, the gap had slightly droped to 2’25. On the only designated hill of the day in Hohn, Reutter and Lubbers were the first two to be dropped. At the summit, Belgian Van Melsen conquered the most climbers points (3) while the pack moved closer, at 1’45’’. With 36kms to go, Frenchman Jarrier decided to stop his efforts leaving his three former companions carry on their ride at the front. One after the other, the riders from teams Quick Step, Bora-Hansgrohe, Lotto-Soudal and Katusha-Alpecin intensified the pursuit and the last three breakaway survivors were caught with under 15kms to go just after the Bonus sprint claimed by Reynders (earning him 3 bonus seconds). As soon as the break was caught team Sky led by Vasil Kiryenka and Geraint Thomas himself powered to the front. A perfect move that allowed Luke Rowe to give it a go with under 10kms remaining. The British rider’s efforts would prove to be vain as he was chased down by the Bora-Hansgrohe boys and caught with 5kms to go. Time had come for a royal sprint as the pack entered the city of Bonn. Thanks to the hard work of his Bora-Hansgrohe squad, Pascal Ackerman produced his effort with 200m only to be outpaced by “Colombian bullit” Alvaro Hodeg. The Quick Step sprinter finally claimed stage 1 victory ahead of Ackerman and Niccolo Bonifazio (TBM). He adds a fine line to his already impressive record after already winning at the Tour of Poland and the Vuelta a Catalunya this year. The 21-year-old conquers the overall leadership and will be carying the orange jersey on his shoulders tomorrow for stage 2 of the race between Bonn and Trier. He also leads the points classification and the best young riders’ standings. 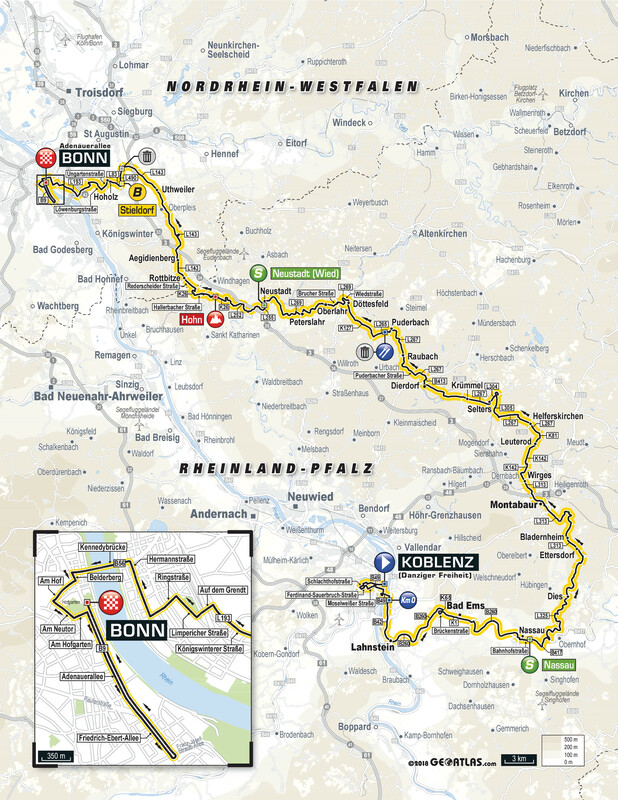 The opening stage of the Tour will be from Koblenz to Bonn. The peloton will start off from the Deutschen Eck, the confluence of the Mosel and Rhine rives with a neutralised ride of eight kilometers. They will ride along the Mosel on a loop through the Old Town over Rauental to Schloss Koblenz. The Rhine will be crossed for the first time of the day on the Pfaffendorf Bridge. 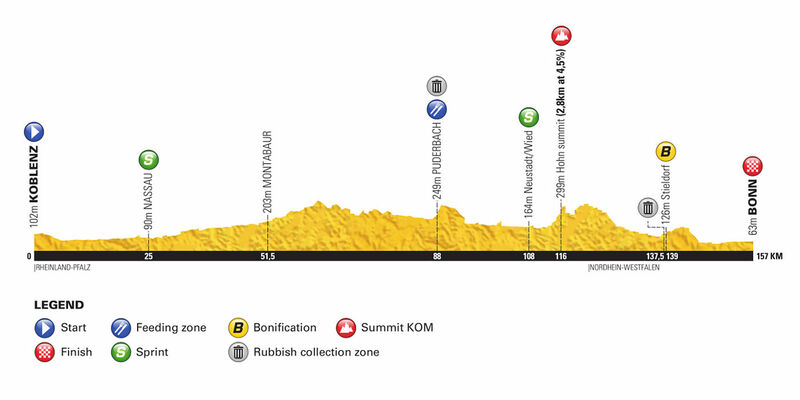 Shortly thereafter the sharp start for the 157 kilometers will take place on the B42. An exciting race will start right from the first kilometers, because the first sprint comes after only 25 kilometers in Nassau. After the valuable points for the green jersey have been gathered, the course climbs through the foothills of the Westerwald over the Montabaur to the Wied river.I n Neustadt (Wied) at km 108 is the second sprint. Only some 8 km later follows a short but steep climb in Hohn – the winner of this ranked mountain will be rewarded at the finish with the mountain jersey. In Rederscheid the riders cross the border from Rheinland-Pfalz to Nordrhein-Westfalen and go east from the Siebengebirge towards Bonn. 18 kilometers before the finish line in Stieldorf, just before Bonn, there will be a bonus sprint, in which the riders can gain valuable bonus seconds towards the overall rankings. The sprint preparations will be in full swing when Bonn is reached via Oberkassel and Beuel. Passing the Kurfürstlichen Schloss and the Hofgarten, the peloton will tackle the final five kilometers of the first stage. They continue further south for another flat 2.5 kilometers to the Helmut Schmidt Platz. There they make a u-turn and go back at full speed to the finish at the Hofgarten.